At Riverstone Montessori Academy, we are proud to abide by the AMI (Association Montessori Internationale) principles. This governing body was established by Dr. Maria Montessori to provide quality training and oversight for Montessori schools around the world. Not all "Montessori schools" follow the Montessori philosophy or maintain the high standards of training of Dr. Montessori's original design. AMI insists that all curriculum, materials, classrooms and teacher training be designed to benefit the child - first and foremost. An AMI accreditation helps insure your child receives the highest quality experience in education. AMI Montessori teachers receive the most intensive training of any Montessori program. Even for "pre-school" AMI Montessori teachers receive a Masters level training to work with your child. 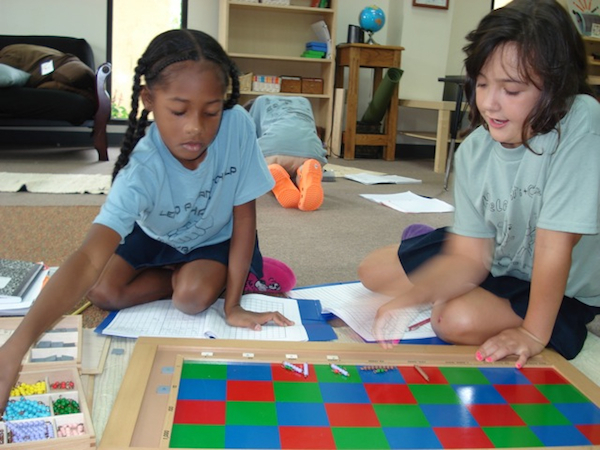 As a result they are sought out to work in Montessori programs throughout the world. They can teach in all subject areas in a 3-6 year age span in addition to being trained to develop a student's independence and self-esteem. AMI Montessori teachers are fully versed in developmentally appropriate classroom management techniques and classroom design. AMI Montessori materials have been scientifically designed to meet the specific educational needs of a child. The materials in the AMI Primary and Elementary classroom have been refined over 50 years of study to isolate and address a variety of advanced academic concepts in a manipulative format that young children can easily understand and enjoy. Dr. Montessori recognized the importance of a multi-sensory approach to education and the past decade of neurological research in education continues to support her ideals. Her materials are often reproduced and repackaged for traditional environments. AMI classrooms contain high-quality materials designed to be both functional and attractive to engage a child's innate curiosity. They are purchased from approved manufacturers to insure quality and safety. An AMI Montessori classroom is much larger than a traditional classroom environment. Designed to meet the physical needs of children of different sizes, our classrooms have room for children to move about freely and work comfortably in a variety of ways. Rather than being overly garish with primary colors, the Montessori classroom is designed to be warm and home-like to allow a student to relax and concentrate on interesting educational activities. Schedule your tour of a Montessori Classroom today!